The Very Best Kentucky Derby Hats and Whimsies, like this High Fashion Couture Fascinator, will get all the attention at the Kentucky Derby. Dallas Vintage Shop has DFW’s largest variety of Kentucky Derby Hats. 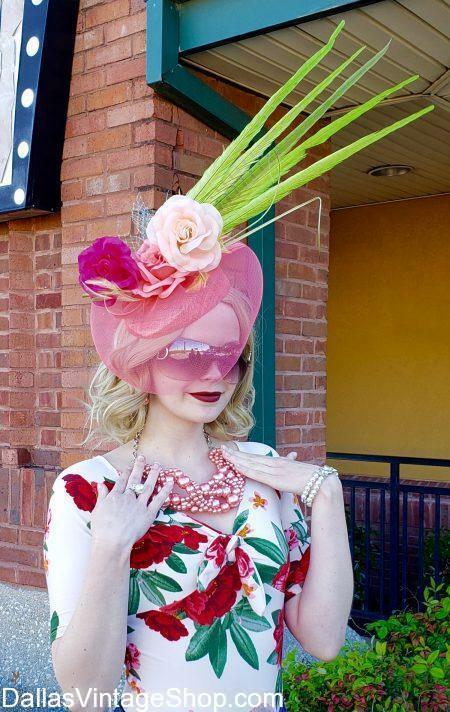 From Avant-garde to Vintage Fashions, from Gorgeous Whimsies to Fabulous Oversized Derby Day Hats, from Bodacious Creations to Refined, Sophisticated Millinery Achievements and from Simple to Customized Hats, we have Dallas’ grandest collection of Derby Dame Hats. Get the hat that makes the statement you want to make at the Kentucky Derby here. We have many, one of a kind, one per season, special hats designed especially for your Kentucky Derby Event. You will find that our Superior Kentucky Derby Hats, Kentucky Derby Whimsies, Kentucky Derby Fascinators and Oversized Kentucky Derby Hats are are unlimited. Our Kentucky Derby Hats are in demand. No other Dallas Hat Shop has the Latest Kentucky Derby Styles, the Largest Kentucky Derby Sized Hats and the most Elaborate Kentucky Derby Hats that compares to our quantity & quality. Kentucky Derby Hats Have Arrived at Dallas Vintage Shop. We have Spring Fashion Hats. Yes, KENTUCKY DERBY Derby Hats Have Arrived at Dallas Vintage Shop. We are dedicated to listing Costume Events & Dress Up Events in the Metroplex. From Bodacious to Refined Sophistication, you’ll find the largest & most diverse selection of Derby Hats for Ladies or Complete Derby Outfits or just Quality Hats for Derby Dames & Derby Gents right here in our shop. Posted in Kentucky Derby | Comments Off on Kentucky Derby Hats Have Arrived at Dallas Vintage Shop. Kentucky Derby Gentlemen, are you ready for Derby Day? 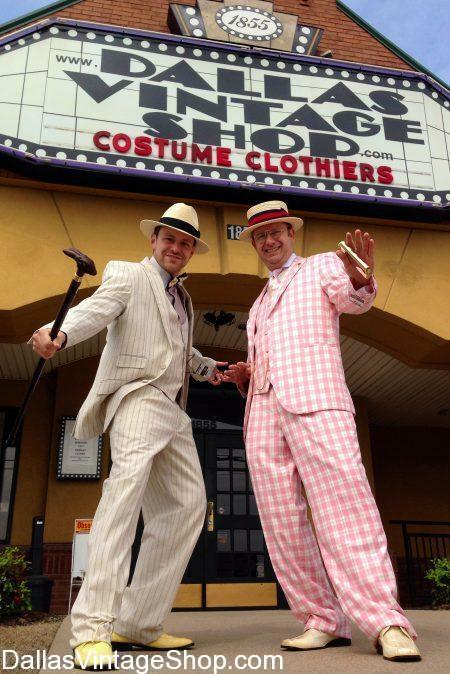 Dallas Vintage Shop has the perfect Derby Suits, Hats, Bow Ties, Shoes, Canes and Pocket Watches to get you in vogue for the Kentucky Derby or Lone Star Park Race Day. Huge Selection of Kentucky Derby Gentlemen Outfits, Derby Hats, Skimmer Hats, Ties & Bow Ties, Shoes, Canes and whatever Stylish Derby Gent Attire and accessories you need. Racks of Kentucky Derby Dapper Suits for Men, Sports Coats, Ties, Bow Ties, Vests, Knickers, Vests, Sweater Vests and Derby Day Men’s hats like Skimmers, Derby Hats, Bowler Hats, Fedoras and many more are in stock at Dallas Vintage Shop. Kentucky Derby Gentlemen, are you ready for Derby Day? Dallas Vintage Shop has the perfect Vintage Inspired Jazz Age Suits, Classic & Unique Hats, Fresh Spring Bow Ties, Two Tone Shoes, Canes and Pocket Watches to get you in vogue for the Kentucky Derby or Lone Star Park Race Day. Kentucky Derby Hat Shop, Glorious Derby Dame Fashions from Vogue to Bodacious! Kentucky Derby Hat Shop Paradise! Welcome to Dallas’ largest & most diverse collection of Kentucky Derby Ladies Hats. Our Enormously Huge Kentucky Derby Hat Shop is the Dallas areas largest Ladies Hat Shop with Giant Floral Design Hats and Vogue Kentucky Derby Hats in stock. Get Gigantic Derby Dame Hats, Avant Garde Fashion Hats, Floral Hats with Large or Small Flowers, Big Hats with Feathers, Netting, Tool, Horse Hair and many other Embellishments. We have ‘On the Spot’ Customizing too. Make sure your Kentucky Derby Hat is a one of a kind. We a supreme Kentucky Derby Hat Shop with giant Hats, Floral Kentucky Derby Hats, Supreme Quality Kentucky Derby Hats, Unique Kentucky Derby Hats and Customized Kentucky Derby Hats. 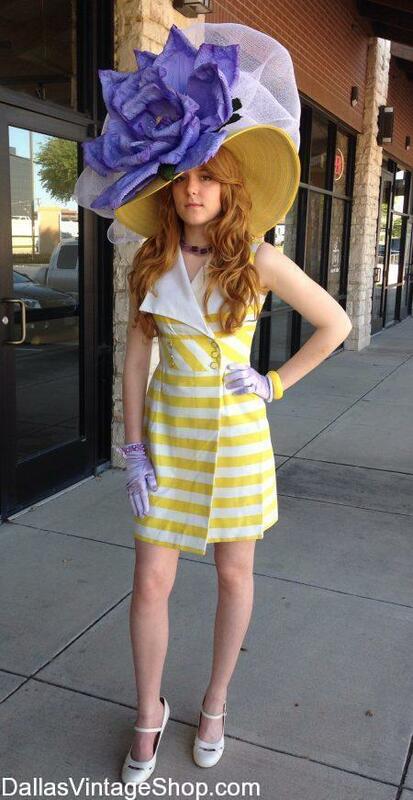 t At Dallas Vintage Shop you will find Derby Dame Fashions and Accessories that are Fresh and Striking. We are indeed the Kentucky Derby Hat Shop Headquarters with! the Metroplex’s most elaborate & diverse collection of Kentucky Derby Ladies Hats. Posted in Kentucky Derby | Comments Off on Kentucky Derby Hat Shop, Glorious Derby Dame Fashions from Vogue to Bodacious! Darling, you simply must see all of the Unique, Fashionable Kentucky Derby Dame Hats, in our shop. Churchill Downs is waiting. We will have the hat that is perfect you you. Our selection is unbelievable and unbeatable. We have Kentucky Derby Hats. We have a Huge Selection In Stock from Bodacious to Sophisticated Fashions. You will also find lovely Derby Day dresses in so many styles from vintage inspired to fabulous spring fashions. Find many, many Elegant, Charming Vintage Inspired Kentucky Derby Dresses and Hats at Dallas Vintage Shop. Tweek your Kentucky Derby Day Style with our Ludicrously Large collection of Downton Abbey and other period influenced fashion attire, hats and accessories. We’ll help you customize your Kentucky Derby hat right in our store while you wait. We also have lovely vintage and vintage inspired Derby Day dresses and all the accessories you need to give you the perfect Lone Star Park Texas Diva or that Kentucky Derby Seasoned Racing Southern Lady Look. You are in Kentucky Derby category.